Do you know how productive you are? How many hours do you spend for work and leisure? I guess many of you don’t know exact metrics and rely upon your subjective assessments like “I think I’m productive enough…” or “I’m not that productive as I should be…”. We all know that translation is labor intensive intellectual activity. Freelance translators, in particular, have to work even harder than their in-house colleagues, since freelancers have to address many other issues in addition to major activity, e.g. administrative (calls, emails, meetings), marketing (advertising, promotion), financial management (invoicing and tax reporting), and other tasks. As a freelance translator, I have a rather tough schedule. Almost every working day I have to translate at least 2000 words to make a good living out of my freelance business. In addition to translation, I spend up to 3-4 hours for communication and scheduling, marketing, and development of my website. How to stay productive and not to burn out with such a busy schedule? Today I will share some of my productivity secrets with you, guys. As usual, I have prepared a nice freebie for you. Below this post, you can download a PDF file with a checklist and links to useful resources to improve your productivity. First and the most important rule that will help you stay productive is setting clear, achievable and measurable goals. For instance, “earn more money” is not a clear goal. How can you actually measure if you are earning more than before? You need to estimate your current earnings, then set a clear goal with a certain period for completion, e.g., “I want to earn $3000 a month in a half-year”. Then six months after you will see if you managed to do this or not. Of course, your goals shall be achievable. If you just started a freelance career, your goal can be “to find the first client within one week” (which is quite possible), but not “to get a six-figure contract in one day”. Probably you already use some to-do list applications. Anyway, I would recommend Todoist.com – easy to use cross-platform application supporting many languages that will help you define tasks and achieve your most ambitious goals. You may also install Google Chrome plugin for quick access to your to-do list. Based on the previous abstract, to achieve a major goal you should fulfill certain tasks. So if your main goal is something really big, you should split the major task into several smaller ones. Thus, you will see that there is nothing too complicated and your goal is achievable through easy little steps. The Pomodoro Technique is a nice time management strategy to stay focused on smaller tasks. You may learn more about this technique from the video below. You’re gonna love it! Another essential thing required to achieve better productivity is to take breaks. No one can work nonstop and remain productive! According to psychological studies, an average time of attention focusing among adults is about 40 minutes. If you continue working on the same task, attention gets distracted thus reducing your productivity. So I have a 5-minute break every 40 minutes of translation. Of course, you may set up your own work-and-rest intervals that fit your habits. If you watched the video about the Pomodoro Technique, you may have noticed that blocking distracting things is important to stay productive. Are you checking Facebook, Twitter or Instagram feed every 10 minutes? I know that it is almost impossible to ignore social updates when you see notifications in your browser. Well, I don’t say you should stop using social networks. But there is a quite good alternative – block distracting websites while you work. Creative developers from Freedom.to can help you to struggle social media addiction during working hours. In the beginning of this article I mentioned that many of you don’t know your actual productivity. I bet you will be surprised how much time you spend for random activities in front of PC during the day. Actually, the figures are not so scary (at least in my case). After installing the RescueTime.com application and running it for about a week, I found out that I’m a workaholic with 78-91% of a productive time per day. This application has rather flexible settings so that you can tune it to your needs. Just install special tracking utility to you PC and set up working hours. After you get first data you may assign categories to unidentified activities. 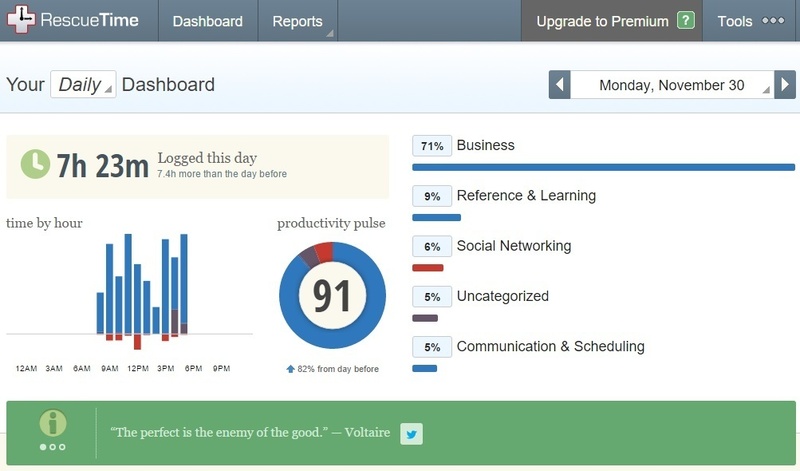 RescueTime also has privacy settings to eliminate certain sites and applications from analytics. For translators, task automation in most cases means CAT tools. I have already mentioned some free CAT tools before. In addition to them you can learn to use shortcuts in various programs. Using shortcuts saves hours of work. Everyone knows such combinations as CTRL+C, CTRL+X, and CTRL+V. But there are far more useful shortcuts that will make your life easier. You may learn more about Windows shortcuts here. Many office workers around the world have to adhere to certain rhythms of life due to the standard business hours. Freelancers working on the web have more freedom in this regard. Some people like working early in the morning, others like the mysterious silence of night work. You are free to experiment and find out which time is the best for work according to your biological clock. When you find it, try to adjust your work schedule to your best productive hours. I know that it can be hard to manage urgent projects ordered by clients from around the world. 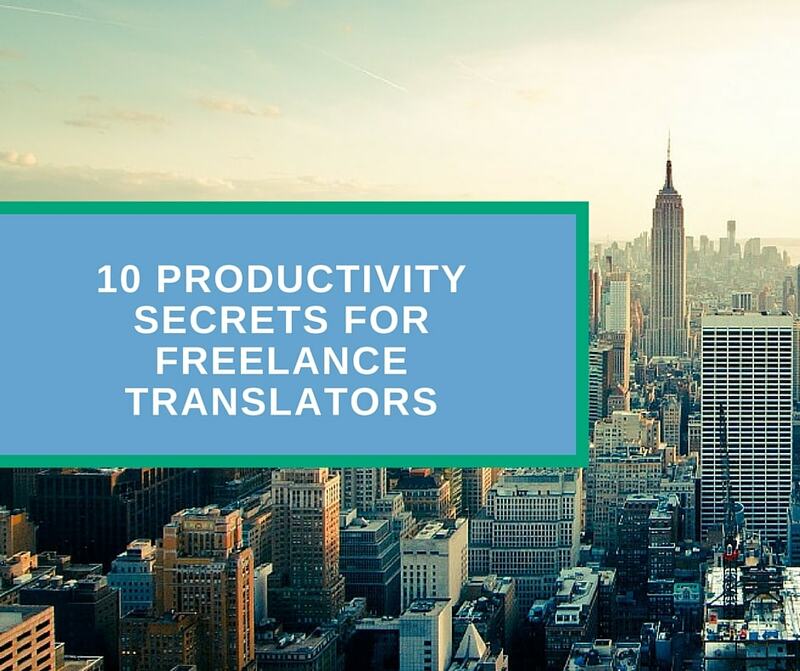 But frankly speaking, many average translation projects require from 1 to 5 days to complete. In this case, even 12-hour difference between you and the client will not be a problem. One more effective method to stay productive is to shift between mental and physical work. Everyone knows that physical exercises are healthful. I go to the gym three times a week. But it is still not enough to stay productive. Remember about small breaks every 40 minutes? “7-minute workout” is a perfect program offering quick and effective exercises that you can do at home. You may download a free app for iOS and Android. This may seem another kettle of fish, but delegating tasks really help to stay productive. From time to time my clients offer large translation projects that I cannot handle alone. For such cases, I have a team of professional translators with whom I can share a large volume of work or even focus on project management functions only. I also delegate Russian proofreading tasks to my beautiful wife – certified philologist and editor with over 5 years of professional experience. Finally, I have to uncover the last secret of productive translation. I like listening to music while working. It helps me to concentrate and adjust to the certain rhythm of work. I also noticed an interesting thing: while translating from Russian into English I cannot listen to songs in the English language and vice versa. If you liked this idea, you may learn more about the influence of various music genres on productivity in this article. At first sight, being a productive translator seems to be a hard task. But taking certain actions and following the above rules you will definitely become more productive than you were before. I will be glad to read your comments about this topic and answer all your questions.